Today marks the much-anticipated release of WordPress 5.0. Wondering how this new update will affect your WordPress site? Well, first and foremost, get ready for a brand new editing experience. This update includes Gutenberg — a new block-based content editor interface that will change the way you create & edit content on WordPress. You can learn more about Gutenberg here, here, and here. 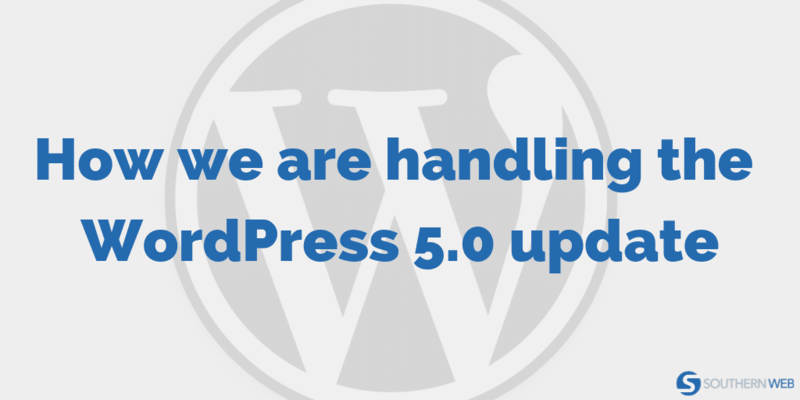 Because WordPress 5.0 is a major update with a lot of technical implications, we will not be applying it to our clients’ sites automatically. There are currently no security issues with delaying the update, so we plan to install the 5.0 update for our clients in early 2019. This gives clients time to test their site for compatibility with WordPress 5.0 and the Gutenberg editor. If you decide that you don’t like the new Gutenberg editor, you can still use the classic editor without reversing the update with the Classic Editor plugin. We have installed and activated the Classic Editor plugin on all of our clients’ sites — just in case. WordPress has said it will officially support the Classic Editor through 2021. To help ease the transition to the Gutenberg editor, we are offering our clients the chance to experiment with it first. Currently, we have two options to choose from. Please contact us for pricing information. Gutenberg Test Drive: Our team will create a temporary, 30-day testing “sandbox” site where we will perform the upgrade to Gutenberg and enable the Gutenberg editor. Clients will receive a private URL and be able to review their website for visual or functional issues, as well as get familiar with how the new WordPress editor works. Extended Gutenberg Test Drive: This option is similar to Gutenberg Test Drive, however, the sandbox sites lasts for an entire year, rather than being limited to 30 days. This will not only give clients more time to evaluate the pending changes in WordPress, but can also be used for testing any other significant changes within WordPress over the next 12 months. Ready to take Gutenberg for a test drive?